For the post-apartheid police force, see South African Police Service. The South African Police (SAP) was the national police force and law enforcement agency in South Africa from 1913 to 1994; it was the de facto police force in the territory of South West Africa (Namibia) from 1939 to 1981. After South Africa's transition to majority rule in 1994, the SAP was reorganised into the South African Police Service (SAPS). Police officials often called on the army for support in emergencies. In turn, one SAP brigade served with the 2nd Infantry Division of the South African Army in North Africa during World War II. After the war, the South African Police joined INTERPOL on 1 January 1948. The SAP relinquished its responsibility for South West Africa in 1981. It took over the South African Railways Police Force in 1986. There were a number of special units within the police. They were formed either to carry out a specific task or to deal with a particular area of crime. The Koevoet, translating into English as 'crowbar', but officially known as the Police Counter-Insurgency Unit (COIN) or 'Operation K' were a major paramilitary police unit in South African-administered South West Africa, now the Republic of Namibia. Active within the Namibian War of Independence from 1979 to 1989, they were held responsible for committing multiple human rights violations, and alongside the South West African Police, they were disbanded following Namibian independence in 1989, and were essentially replaced by the Special Field Force in modern-day Namibia. Formed following a need to defend the border between South Africa and Rhodesia during the Rhodesian Bush War, the Special Task Force were unofficially founded in 1967, and began to be trained to use advanced tactics, such as survival and bush skills, to carry out COIN operations, and drastically reduce police casualties - this unit was known as the 'Bliksems'. By 1975, support of creating the Special Task Force reached the Bureau of State Security, following both the Fox Street Siege, in which the police were unable to deal with a hostage crisis at the Israeli embassy in Johannesburg, and the outbreak of the conflict in South West Africa, stretching the demand of COIN operatives. Finally, authorization of creating the Specialist Task Force was given, following multiple recommendations, and the issues described beforehand. This unit is still in action in modern-day South Africa. Formed in 1992 in the run-up to the 1994 South African election following the end of Apartheid, 'Division: Internal Stability' were tasked with the important role of combating violence in the turbulent years leading up to and after the elections. The unit consisted of 41 divisions, and proved detrimental to preventing potentially thousands of killings during major political violence. 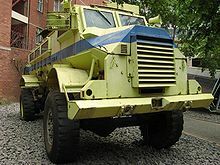 The Casspir, an armoured personnel carrier used by the SAP. During South Africa's rule under apartheid, the SAP operated to quell civil unrest amongst the country's disenfranchised non-white majority. During emergencies they were assisted by the military. Beyond the conventional police functions of upholding order and solving crime, the SAP employed counter-insurgency and intimidation tactics against anti-apartheid activists and critics of the white minority government. From 1961 to 1990, a total of 67 people died in South African Police detention from hanging and torture as well as natural causes as claimed by the Police. On 21 March 1960, SAP officers in the Transvaal township of Sharpeville opened fire on a large anti-apartheid protest outside of the local police station, killing 69 demonstrators and injuring 180 others. Police reports from the time of the massacre claimed that panicking officers spontaneously fired into an increasingly violent crowd; however, other sources claim that the demonstration was peaceful in the moment leading up to the shooting. Evidence given to the Truth and Reconciliation Commission in 1998 suggested "a degree of deliberation in the decision to open fire" by the police. In 1983, the SAP formed C1, a counter-insurgency unit commanded by police colonel and former Koevoet operator Eugene de Kock. C1 was run out of a secluded farmhouse called Vlakplaas until 1992. It functioned as a paramilitary hit squad, capturing political opponents of the National Party government and either "turning" or executing them. C1 was also responsible for several fatal bomb attacks against anti-apartheid activists, including members of the African National Congress. The Vlakplaas farm became the site of multiple executions of political opponents of the apartheid government. The Police Reserve, established in 1973, enabled the government to recall former police personnel for active duty for thirty to ninety days each year, and for additional service in times of emergency. Another reserve (volunteer) force was established in 1966, consisting of unpaid, mostly White civilians willing to perform limited police duties. A youth wing of this reserve force reported that it had inducted almost 3,000 students and young people to assist the police during the late 1980s. The police increased the use of part-time, specialised personnel – such as the special constables (called kitskonstabels (instant constables) in Afrikaans) – to help quell the growing violence in the 1980s. In 1987, for example, the police recruited almost 9,000 kitskonstabels and gave them an intensive six-week training course. Most of these constables were Blacks and Coloreds. These "instant" police assistants were then armed with non-lethal weapons and assigned to areas of unrest, which were often the most turbulent townships. Even with training courses extended to three months, their often brutal and inept performance contributed to the growing hostility between the police and the public by the late 1980s. Although the mission of the SAP grew well beyond conventional policing responsibilities during the 1970s, the size of the police force declined relative to population. In 1981 the police force of roughly 48,991 represented a ratio of less than 1.5 police per 1,000 people, down from 1.67 per 1,000 people in the 1960s. Alarmed by the increased political violence and crime in the mid-1980s and by the lack of adequate police support, officials then increased the size of the police force to 93,600—a ratio of 2.7 per 1,000 people—by 1991. The police were authorised to act on behalf of other government officials when called upon. For example, in rural areas and small towns, where there may be no public prosecutor available, police personnel could institute criminal proceedings. The police could legally serve as wardens, court clerks, and messengers, as well as immigration, health, and revenue officials. In some circumstances, the police were also authorised to serve as vehicle inspectors, postal agents, and local court personnel. After President Frederik Willem de Klerk lifted the ban on black political organisations and released leading dissidents from prison in 1990, he met with the police and ordered them help end apartheid, to demonstrate greater political tolerance, and to improve their standing in black communities. Through the early 1980s, police units were integrated, but most police recruits had been trained in single-race classes, sometimes in institutions designated for one racial group. For example, most black police personnel had trained at Hammanskraal, near Pretoria; most whites, in Pretoria; most coloureds, Bishop Lavis, near Cape Town; and Asians at Chatsworth, near Durban. During the late 1980s, the Hammanskraal college saw a large enrollment of black policemen. As the apartheid era ended, these programs were restructured to emphasise racial tolerance and respect for basic human rights. The first racially integrated intake of recruits began slowly in 1993 and integration was complete by 1995. Today there is only one Police College to train new recruits in Pretoria. The police also increased recruitment among black youth and hired international police training experts to advise them on ways to improve race relations in the service. The basic police training regimen includes courses in criminal investigation procedures, self-defense, musketry, tactical weapons training, drills, inspections, public relations and law. Specialized courses include crowd and riot control, detective skills, horsemanship and veterinary training, and advanced-level management skills. Their basic training lasted 6 months. During the time of the S.A. border war all Policemen were required to complete a 6-week intensive counter insurgence (C.O.I.N.) training at Maleoskop (now closed) in specialised weapons and "bush warfare" in preparation for their 3 months "call up". (Some volunteering and been called up more frequently.) Since 1990, South Africa also has provided training for police from Lesotho, Swaziland, Malawi and the (then) Zaire. The climate of escalating violence in the early 1990s often posed even greater challenges to the police than they had faced in the 1980s, as violence shifted from anti-government activity to a mosaic of political rivalries and factional clashes. At the same time, many South Africans feared that the police were causing some of the criminal and political violence, and they demanded immediate changes in the police force to mark the end of apartheid-era injustices. To meet the new challenges, the 91,000 active police personnel in 1991, including administrative and support personnel, were increased to more than 110,000 by 1993 and 140,000 by 1995. Throughout this time, police reserves numbered at least 37,000. In 1996 the combined active and reserve police represented a police-to-population ratio of almost 4.0 per 1,000. As part of the overall reorganisation of the police, the government merged the formerly dreaded Criminal Investigation Department (CID) and the police security branch to form a Crime Combatting and Investigation (CCI) Division. The new CCI, with responsibility for reversing the rising crime rate, combined the intelligence and operational resources of the security police with the anticrime capabilities of the CID. Minister of Law and Order Hernus Kriel in 1991 also appointed an ombudsman to investigate allegations of police misconduct. He increased the recruitment of black police personnel, formed a civilian riot-control unit that was separate from the SAP but worked with it, developed a code of police conduct agreed upon by a number of political parties and communities, and substantially increased police training facilities. In 1992 Kriel began restructuring the SAP into a three-tiered force consisting of a national police, primarily responsible for internal security and for serious crime; autonomous regional forces, responsible for crime prevention and for matters of general law and order; and municipal police, responsible for local law enforcement and for minor criminal matters. He also established police/community forums in almost every police station. In 1995, the force absorbed the police forces of Bophuthatswana, Ciskei, Gazankulu, KaNgwane, KwaNdebele. KwaZulu, Lebowa, QwaQwa, Transkei, and Venda, and was renamed the South African Police Service. Until 1952, they were incorporated into the British honours system. Thereafter they formed part of the new South African honours system. ^ a b Van Lill, Dawid (2004). Van Lill's South African Miscellany. South Africa: Zebra. ISBN 9781868729210. ^ a b c d Opolot, Jame S. E. (2008). Police Administration in Africa: Toward Theory and Practice in the English-speaking Countries. University Press of America. ISBN 9780761831310. ^ "South Africa". Interpol. Retrieved 12 August 2015. ^ "Commissioners of the South African Police (1913 - 1994)". South African Mirror. Retrieved 14 January 2019. ^ "Generals of the SA Police". Issuu. Retrieved 14 January 2019. ^ Anonymous (31 March 2011). "List of deaths in detention". www.sahistory.org.za. ^ "The Role of Political Violence in South Africa's Democratisation" (PDF). This page was last edited on 18 April 2019, at 13:07 (UTC).